Currently in Australia Ostrea angasi oysters (angasi) are being cultured on a small scale, with several farmers growing relatively small numbers of angasis on their predominately Sydney rock or Pacific oyster farms. Very few farmers are culturing commercially viable quantities of angasi oysters. There are several reasons for this. Although angasi oysters occur in the intertidal zone, they are naturally most abundant in the subtidal and are less tolerant of fluctuating environmental conditions, especially temperature and salinity, than other oyster species. They also have a much shorter shelf life and start to gape after one to two days. Additionally, angasi oysters are susceptible to Bonamiosis, a parasitic disease which has caused major mortalities in several areas. Stress caused by extremes or a combination of factors such as high stocking densities, rough handling, poor food, high temperatures and low salinities have all been observed to increase the prevalence of Bonamiosis. Growth rates of angasi oysters have also been variable, ranging from two to four years to reach market size. 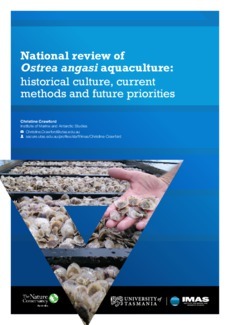 From discussions with oyster famers, managers and researchers and from a review of the literature I suggest that the survival and growth of cultured angasi oysters could be significantly improved by altering some farm management practices. Firstly, growout techniques need to be specifically developed for angasi oysters which maintain a low stress environment (not modifications from other oysters). These include growing the oysters low in the water column or subtidally, reduced densities and more careful handling. Improved broodstock management, including selective breeding and quality control of spat from the hatcheries should also lead to consistent and higher growth rates. Increased shelf life can be attained using methods already developed although they are very time consuming. Mechanisation and new methods of packaging such as modified atmosphere or quick freezing should be investigated.